WrestleMania sets record for MetLife Stadium’s highest-grossing entertainment event. 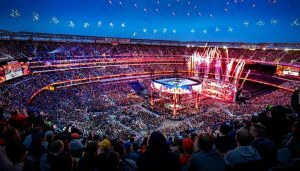 WWE announced that WrestleMania 35 broke the record for MetLife Stadium’s highest-grossing entertainment event. The annual pop-culture extravaganza grossed $16.9 million, surpassing the venue’s previous record of $12.3 million set by WrestleMania 29 in 2013, as a sold-out crowd of 82,265 fans from all 50 states and 68 countries converged on MetLife Stadium in East Rutherford. As part of the weeklong WrestleMania celebration, WWE will host five consecutive nights of events at MetLife Stadium and Barclays Center in Brooklyn.